CHICAGO — Just in time for summer activities and events, SanTan Brewing Company’s most popular seasonal Mr. Pineapple Wheat Ale is back and available now in redesigned Rexam 12 oz. cans. This year, the brewery has teamed up with Chiquita to use Rainforest Alliance Certified pineapple juice for a more sustainable, socially conscious and tasty beer. Winner of the silver medal at the Great American Beer Festival, Mr. Pineapple is a refreshing and fruity traditionalGerman Wheat Ale using two-row, white wheat, caramel and Munich malt. Fresh pineapple is added during the primary fermentation then crushed and cooled to allow the natural flavors to infuse the beer. 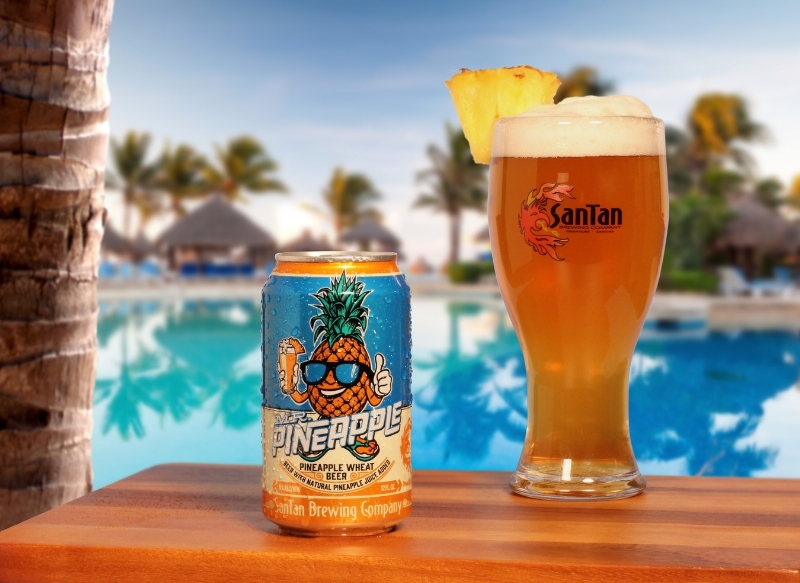 Originally created as a signature craft beer for SanTan Brewing Company’s annual Luau celebration, Mr. Pineapple’s popularity among craft beer lovers grew rapidly in its first few years of production. To meet increasing demand, SanTan teamed up with Rexam and began canning Mr. Pineapple in 2013 – making it easily portable and ready for summertime cookouts, pool parties, beach days and other outdoor adventures. The brewery also benefits from the many other advantages aluminum cans deliver. They provide complete barrier protection from light and oxygen helping to preserve the beer’s taste and freshness longer. Cans are also light-weight, which can reduce shipping costs. And they are the most sustainable beverage package in the world, recycled at double the rate of any other option. Mr. Pineapple in cans is currently available at select retailers throughout Arizona, Southern California and Texas. In 2009, SanTan Brewing began distributing their core and seasonal brews throughout the state of Arizona, operating with a mission to pair craft beer with craft food that would inspire great conversation and good times.2014 marks the beginning of taking this journey throughout the Southwest and California. SanTan beers have won numerous national and statewide awards including two medals at the US Open Beer Championship: bronze in 2013 and gold in 2011. SanTan Brewing also took home a silver medal at the 2011 Great American Beer Festival and won Best Brewery in Arizona, selected by the Phoenix New Times and the Arizona Republic, in 2013 and 2011. To find a pint or can of SanTan’s beers near you, visit SanTan Brewing Company’s Beer Finder online at www.santanbrewing.com/the-beer/beer-finder. Rexam is a leading global beverage can maker. We are business partners to some of the world’s most famous and successful consumer brands. Our vision is to be the best beverage can maker in the world. We have 55 can making plants in more than 20 countries and employ around 8,000 people. In 2014, our sales were in the region of $5.8 billion.